You'll learn Brenda's FUNdamentals™ system for training dogs and have a variety of opportunities to demonstrate your skills while learning the materials in this course. This course combines online learning with webinars, on-site training, and mentoring with Brenda Aloff. Upon successful completion of the course, you'll be certified as a FUNdamentals™ Instructor. What is the FUNdamentals™ Training Program? FUNdamentals™ is a wonderful system for training dogs. FUNdamentals™ includes teaching the dog Attentiveness, Self-Control, Body Handling and Foundation Obedience (including Sit, Down, Recall, Leave It, Walking Nice). It makes sense to dogs and to their owners, based on twenty years of experience in working with entry level dogs and students. These folks need special care and handling - and they become your consistent, future students, too. FUNdamentals™ works because it is based on what dogs need to live happy lives with their human companions. It's a very different curriculum, not based on fads or trends, not based on military training (that is not always friendly to the lay-person), not based on performance training (that might have no interest to the basic pet person). Yet, FUNdamentals™ is an effective, pet-person-friendly training that will also interest performance dog and working dog handlers. FUNdamentals™ focuses on fundamental skills for ALL types of dogs. Fundamentals™ training enhances any performance, competition or SAR work that might be done later, even if the student doesn't know if the future holds the fun of performance or working dog events with their dog. Why Earn the FUNdamentals™ Instructor Certification? 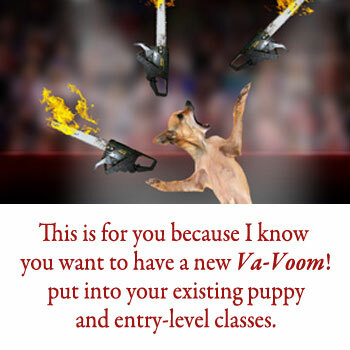 You want your puppy and entry level classes to be a cut above the rest and based on proven protocols that work. You who are ethical, humane and dedicated-to-dogs and their humans. You want the highest percentage of your entry-level customers stay in classes, stay interested and stay on as thrilled and happy fans of your business. You want more Va-Voom! in your classes. 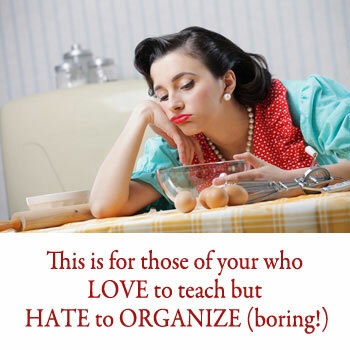 You love to TEACH but hate to ORGANIZE. The FUNdamentals™ Instructor Certification Course also provides detailed and step-by-step instructions to guide you through the curriculum of each week, homework sheets for students, interesting handouts for students and business forms. It's all in one convenient package! You want other professionals that work with your clients' dogs, such as veterinarians and groomers, to adore your work. This means not just good professional relationships, but referrals, too! All of this training is absolutely clicker-friendly, but can be used with or without clickers. For most entry level students, the dog is already overwhelming, and when adding a clicker along with the dog, leash and treats, it makes the student’s head spin around. Brenda and her instructors have taught both clicker and non-clicker positive-reinforcement-based classes, equally effectively. Some dog training experience. Teaching entry level classes is not for the total beginner. If you have been seriously training dogs for at least 2 years and are interested in instructing, we want you to be the best teacher you can be! You must complete the online class The Engaged Dog (formerly Foundation Skills Boot Camp) in its entirety. You must complete the online class FUNdamentals Instructor Certification Course in its entirety. References from professionals you are associated with, such as your veterinarian, instructors whom you have trained with and co-instructors you have taught with. You must come and intern with me for two 5 day internships. There are a variety of video assignments for you to complete. Who’s Teaching The FUNdamentals™ Instructor Certification Course? Brenda Aloff, author, clinician, speaker and Pet Behaviour Counselor with hands-on teaching and training experience of 20+ years. My dream is to build a training community that has a support system. A training community that presents training in a deliberate, systematic and consistent way to our students. A training community that supports sensible and effective, yet humane training. A community in which we can go to each other for help and support. I am hoping to develop instructors who are qualified enough to help me mentor others. This will involve qualifying and then serving as a mentor. This would be a position in which we make a financial arrangement for your time spent helping other instructors who are less experienced than you. The material from the The Engaged Dog online course is a comprehensive educational experience that goes over in detail the Foundation Skill Set required to teach FUNdamentals class (and more!) The FUNdamentals Instructor Certification Course covers canine social development periods, teaching classes, class organization and will review and test you on the exercises and learning theory you learned in The Engaged Dog. During your internship and education process, we will be available via email or telephone. After your certification, there will be opportunities for On-Going Mentoring. This will provide you with advice and help for difficult dogs and students, training advice and moral support. There are special reduced rates for consults for you and your own dog, or if you need to consult about a particular case history. You are required to provide CEUs to maintain your status as an FUNdamentals™ Authorized Instructor. Any CEUs you get through other professional organizations are applicable. I would like to see 10 CEUs per year and at least 2 CEUs must be with Brenda Aloff annually. Enroll in The Engaged Dog online course first. You may enroll in the FUNdamentals program simultaneously. Much of the FUNdamentals course assignments are based on material in The Engaged Dog. Once you've completed the online enrollment process, you will be given access to the classrooms and can begin right away! These courses are the first steps towards your FUNdamentals™ Instructor Certification. Written assignments can be completed on your computer. These are in Microsoft Office Word and also available in Apple Pages for Macintosh Computers. The course fee of $2497.00 includes the entire certification process and the online FUNdamentals Instructor Certification Course. This includes your intern time of 10 days total spent with me (Normally I charge intern time at $200.00 per day, so this is a $2000 value). I will spend lots of time reviewing your videos and homework, as well as helping you throughout the process. In short, you are getting your money’s worth out of me! After your are certified, the annual network fee is $125. This maintains your certification as a FUNdamentals™ Authorized Instructor. 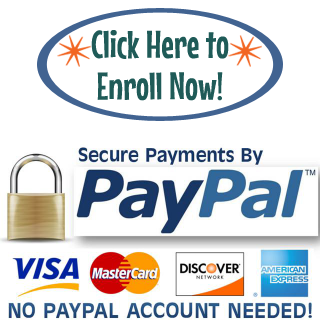 On-going support: Calls or email that can be answered in 15 minutes or less. Listed as a FUNdamentals Authorized Instructor on the Brenda Aloff website. I will have a hyperlink to your website with a brief biography and picture of you, with your location and business contact information.